Tippmann does everything to the extreme when it comes to making quality and reliable products, and they are treating their first airsoft release with the same determination for customer satisfaction. While Tippmann is new to the airsoft industry, they are the long standing heavy weights of the mil-sim paintball industry, and we think they will carry over nicely on this endevour. When you get a Tippmann product you know they will stand by it with their excellent one year warranty. Best of all, these guns are made right here in the US! Full Auto Performance - No Batteries Required Get a secondary upper, or replaced a damaged one. 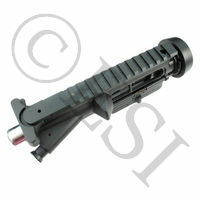 The M4 Carbine is Tippmanns first product for airsoft directly. It is a GBB (gas blow back) which gives the gun a realistic feel when firing, including some recoil. The gun can be powered by either Co2 cartridges or their is remote line adapter included, also the gun uses no batteries. As with many other Tippmann products the M4 Carbine features receivers comprised completely of aluminum, as well as the barrel assembly and stock tube. With so many parts being metal it is easy to see why many players turn to Tippmann products, the added security is always a positive. As for firing modes, this marker has three firing modes, being safety, semi, and fully automatic, these modes can be adjusted to shoot a rate of fire in between eight and fifteen rounds per second. The selection of firing mode is very easy, and utilizes a selector switch to choose between the three modes. Velocity is an important factor when considering a new airsoft gun, the M4 Carbine is adjustable between 300-400 feet per second (using a 0.20 gram BB). Internally the gun features adjustable hop up. Amongst the features of durability it is easy to look over how easy these markers are to maintain, as they dont need it often. However if you do need to service it, fear not as it tears down like a real M4 rifle, but features no gear box. As well as the internals of the gun being easy to work on, the magazine is also easy, as it features toolless magazine disassembly. Attachments are another category the M4 Carbine excels in, as the shroud features an 8 sided picatinny rail system, as well as a full length picatinny system on the top of the marker. 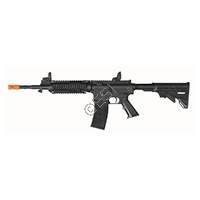 Building upon the attachments more, this airsoft gun accepts many real AR stocks as well as handguards, and can use many AEG magazines while the remote line system is being utilized. Also the M4 Carbine can accept AEG inner barrels.